Pajeon, p’ajon, pajon, pa jun, pageon, jeon…I’ve seen so many variations on the name that I just decided to go with calling mine—Korean Pancake. Like the various spellings, recipes vary as well. Some have the egg beaten into the batter, but I prefer it spread on top (or on the bottom), giving me crispy, eggy edges. Other recipes load up on vegetables and other stuff, yet I tend to keep it simple. This Korean pancake is one of my go-to recipes, especially good when I don’t know what to make for dinner. 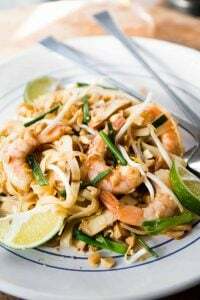 Sure, you can add prawns, chicken, corn, bits of seaweed, tofu, mushroom slices, kimchi, asparagus slices, or some other cooked or shredded vegetables that you have on hand. I even have a sweet potato that I’ve lost interest in that I’m eyeballing with great interest. When I bought it at the market, it seemed like a good idea at the time, but if I oven-roast pieces until nicely browned, why not? But do try to keep your pancake relatively simple. To me, there’s nothing worse than a big glop of indistinguishable food, no matter what you’re making. One thing I do always add, though, is finely-shredded dried Korean red peppers; the delicate thread-like strands sold in big bags in Korean markets. They’re sweet and spicy-hot, and are one of the world’s great lesser-known food ingredients. And at around 2€/$2 per big bag, they’re also one of the world’s lesser-known food bargains. Tell your friends! Although it’s delicious served warm, I appreciate the pancake best when it’s served at room temperature, which makes it a pretty great summer lunch as well, served with rice and a pile of crunchy cabbage and radish salad, dressed with sesame-lime dressing. I hope it becomes a staple in your repertoire as much as it has in mine. 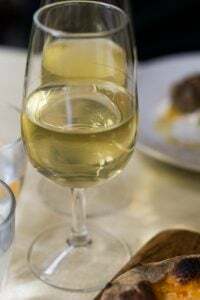 There’s plenty of variations on this recipe and you can certainly make your own up, using some of my suggestions above. I find a non-stick skillet yields best results, but if you use a cast iron, be sure to add enough oil to prevent the pancake from sticking. I use relatively high heat since I want a nice, browned crust.A large spatula works best for flipping it, although you can slide it onto a dinner plate and flip it that way, or even cut it in half, then flip each piece separately. Next I’m going to experiment using sparkling water, or maybe add a pour of beer in place of some of the water. 1. Stir together the flour, water and salt until just mixed. 2. 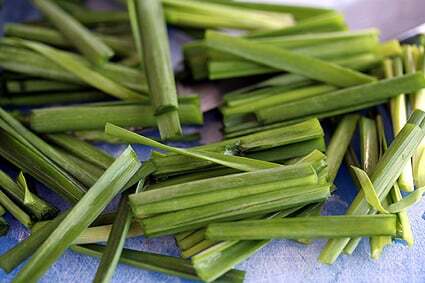 Chop the green parts of the scallions into 3-inch (10cm) lengths. Reserve the white parts for another use. 3. 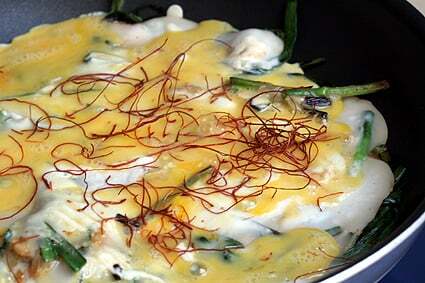 Heat a thin layer of vegetable oil in a 9 or 10-inch (23-26cm) skillet, preferably non-stick, until hot. Fry the scallions until they’re completely cooked through and soft. Add a touch of soy sauce to the pan when they’re almost done, to season the scallions. 4. If using other ingredients, any vegetables, kimchi, or prawns—what have you‐add them now, then toss a few times to heat them through. 5. Pour the pancake batter over the scallions (and other stuff in the pan), spreading the batter, and cook a few minutes until the bottom is nice and brown underneath. Lift the edge to peek. 6. Pour the beaten egg on top then swirl the pan to even out the egg a bit, still keeping it pretty uneven. Distribute the dried pepper strands over the egg, if using, and cook until the egg is just beginning to firm near the edges. 5. Slide pancake onto a cutting board, then cool to room temperature. 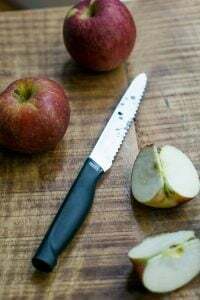 Cut into six or eight wedges, and serve with dipping sauce made by mixing 3 parts soy sauce with 1-2 parts rice vinegar and a few drops of sesame oil. A bit of chile oil can also be added. Wow, this seems like a must try. I am currently fermenting kimchi, as you have instructed in a previous post. Now this…. Oh, yum! That looks like the Korean version of a fritata, just toss in whatever you have, add a binder, and voila, quick tasty dinner. Thanks for the heads up on the peppers (I thought it was saffron in your first photo). We have a big Korean market here (H-Mart) that surely carries it. I’ll definitely pick some up next time I’m there. I became quite a devotee of Korean pancakes after spending some time traveling South Korea with a good friend of mine who’s Korean American. Practically every meal we had started with a Korean pancake. I fell in love. I only wish there were more Korean restaurants in London…my idea of heaven would be a restaurant devoted to Korean pancakes. We’ve got two devoted to okonomiyaki (Japanese pancakes) so maybe Korean will be the next big thing! 2nd favorite thing about Korea were the Korean bath houses and the NY Times just wrote a big article about the new on in NYC so maybe Korea will be the next big thing? 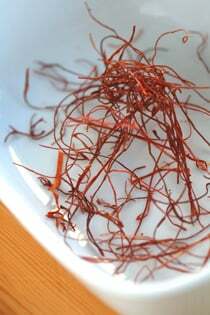 rhaaaa, now i’m craving this -shredded dried Korean red peppers, would be wonderfull to see and taste those delicate filaments on anything. I’d even like to try this on a good scoop of vanilla ice cream ! I thought it was saffron too! This afternoon I have an appointment in the part of Milan where there’s a shop selling Korean specialities:what a great excuse to go in: must have those strand-like peppers! You will have to hit the Korean section of Manhattan next time your here in NY! Lots of good eats for sure. Whats next chocolate and kimchi? Hmmmm. It kind of looks like okonomiyaki, a savory Japanese pancake, which is traditionally served with Kewpie mayo and a savory sauce on top. Do you know if the Korean version uses any kind of condiments on it typically? I have some of those shredded peppers and never knew what to do with them. Thanks! Jeremy: I did hit the Korean area when in New York City, but they were hyper-stingy with the banchan. They have 4 of us just three dinky bowls! Anita: I’m glad you like her-isn’t she hot? This is SO going to be dinner tonight – I get to cook for me only and this just looks fantastic – i’d have it now if i could, except I’m at work. I’ll have to procure some of those Korean peppers at some point too – they looked a little bit like saffron threads. I love a savory pancake (who doesn’t?). And those hot and sweet pepper threads! Yes, please. I love that you have put your own twist on the Korean pancake! I never thought of adding an egg atop it. Pajun are always awesome. I love to include oysters and green onions at all times in mine. Becke: Koreans sometimes dip the pajun into a soy sauce mixture, and sometimes eat it plain. It is somewhat similar to okonomiyaki (but no kewpie mayo!). I am interested in much cooking that food culture and you of your country made so that you are so. And I support your site. If there is time, please come in my site. You know how books sometimes stack up on the bedside table, unread? Usually it’s due to lack of time and/or laziness. I’m finding the same phenomenon applies to David L. recipes. I see a post, say to myself “that looks fantastic,” make a mental note to prepare it, and then time slides…on…by. This goes all the way back the the post on kouign amann! Anyway, this one joins the pile. Sigh. 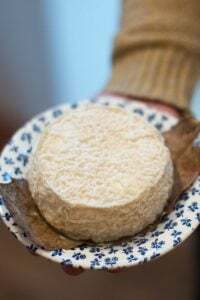 Of course I was delighted to read recently about the goat cheese custard recipe you didn’t get around to making for a decade. I am not alone. Korean pancake reminds me of a thicker japanese version: Okinomiyaki, which has hab dash of shredded cabbage….and can be eaten with sauce. I haven’t eaten it for a looooong time. Maybe I should make Korean pancakes. Miam! Sob, sob, no red pepper threads at the mini Korean shop in Milan…..
Jennifer: Next time you’re in Teo, tell Matt I said hi! I love his gelato…a lot. M: I think there’s a zillion versions of this; I’ve seen some thicker, too. Give it a try! I can’t wait to try it! Thanks for the links, too – SO helpful. 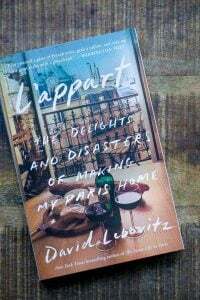 I’m a new transplant to Paris (from Austin, actually) and really appreciate all the good stuff you put on your blog! My mom sometimes uses pajeon flour instead of regular flour which is already seasoned and does not require egg in the batter, only water. It’s probably loaded with MSG but it makes the pajeon so much crispier if you like it that way and also taste better! It’s available in Korean groceries and comes in plastic pouches. It’s kind of like those tempura flour if you’ve seen them around..
Our family favourite for the toppings are green onions and pieces of squid! oh and korean chili pepper flakes and diced green onion added to the dipping sauce. yum! “Jeon” is a generic name for those types of savory pancakes. “Pa” refers to the green onion (the kind whose diameter at the white part is 2~3 centimeters, bigger than what is usually referred to as scallion). Incidentally, scallion, in Korean, is called “Shil-pa,” where “shil” means thread, or in this case, thin as a thread. Koreans attach the main ingredient of the jeon in front of the word jeon to indicate what kind of jeon it is: e.g. “go-gi-jeon” (“go-gi”=meat) or “hae-mul-pa-jeon” (“hae-mul”=seafood, seafood and pa jeon). Jeon lends itself very nicely to interpretations, and I hope you’ll experiment too. At home, we made Kimchi-jeon on rainy days. Old men love it as “an-joo” (snacks to eat while drinking). This sounds wonderful. If you were to make this for a group would you just double or triple and cook in batches or make it all together. I remember eating these often when I lived in South Korea in the early-90s as street food outside The Nashville bar in Itaewon. Back then I called them ‘grass pancakes,’ because they sliced the scallions into very thin blades of… well, it looked like grass. But they were delicious served with a spicy dipping sauce. Aah… what a great food memory! If you make the version with kimchi. Use only flour, water, gochujang (red pepper paste) and diced kimchi. You can add some sliced korean peppers for an added kick. The gochujang gives it this nice orange/red color. You won’t need much salt if you add the paste. Mix it all up and fry in small patches in a non stick pan with some oil. Perfect for rainy or dreary days. Well, let me be the first to admit I’ve never had a savory Korean pancake. At any rate, your recipe and photos have certainly piqued my interest; it’s good to know I don’t have to run out for any special ingredients to make this lovely pancake. gah! You beat me to it! 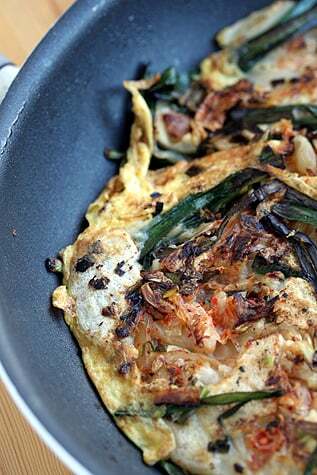 I posted a kimchi pancake recipe too, although it’s really different from yours. Mine is a break from tradijeun ;) and more fusion. Have you thought about using rice flour instead of wheat? Hi David, I’m one of your silent reader and this post spur me to drop a comment as I simply love the simplicity of this dish. i’ve eaten my styles of asian pancakes eg; taiwanese, chinese, penang, etc but this is one of my favourite as the kimchi and scallion bring about the best combo. Looking forward to your great recipes. My favorite form of jeon is with (napa) kimchi. Just chop the kimchi roughly, and use some of the liquid in place of the water (you don’t need the hot pepper paste) = pure kimchi flavor, and you don’t even need any dipping sauce. Bindaedduk is another name for jeon…I think the difference is that bindaedduk are generally smaller (more American pancake-shaped/sized). But only jeon seems to appear on menus. I should ask my mom what the difference is. Made this last night. I don’t know what I did wrong, but what I made really was a mess! 1/2 cup flour and 1/2 cup water yielded something VERY thick. When I tried to pour it over my pan of vegetables (green onions, mushrooms, tomatoes) it wouldn’t spread. Just sat there in a gooey lump. Still ended up tasting pretty good (except where there were thick layers of just batter), but definitely didn’t work out the way I expected! As Cathy noted above, she used handmade rice flour (click on her name to see her beautiful jeon), and as S pointed out, some Koreans use special flour or mixes for theirs. Jill: Yes, Monday was a holiday in France. It’s worth another trip, though. That sugar’s pretty great to play with. 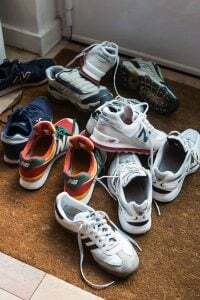 and it’s become exorbitantly expensive”. Have you run across decent Parisian pizza? I forgot to tell you how good and scary that looks at the same time. I must try one! David, can’t wait to give them a try. I watched the two videos you posted. Both of the ladies added the veggies raw. You sauteed yours first, which makes sense to me. Is that a personal preference, or do other recipes call for cooking the vegetables first? Just curious. Thanks for your wonderful blog!! Hi Marsha: Yes, I would cook vegetables first. I suppose you could finely grate things like carrots or parsnips and use them as is. But I always pre-cook them. Enjoy! David, thank you so much for posting this! I’m obsessed with Korean food (My dad lived there for five years… I’ve never been so bitter as when he chose to move away, callously depriving me of the opportunity of visiting him and gorging myself on delicious Korean food) but it never occurs to me to try making it. This looks so easy! I made this a few nights ago with scallions and shrimp and really enjoyed it. I noticed that the batter, however, was a little thick and did not spread out over the veggies and shrimp without some prodding from my spatula (which resulted in a not as pretty, but still tasty pancake). Would this problem be solved if I just added a tiny bit more water to the batter? Or would it become too watery? 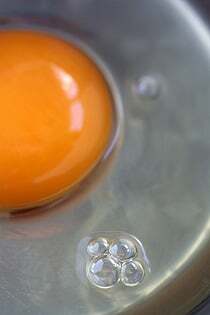 The addition of the egg, by the way, is genious! Hi DD: The batter can be a bit thick, so I do spread it. I also use French flour, which is slightly finer than US flour, so you can add a bit of water. I did try the recipe with 6T of water, but the batter was too thin and it was a messy chore to flip the dang thing. I would maybe add a bit of water, or try using some rice flour as suggested, in place of some of the regular flour. My dad really loved jun, so my mom used to make all different kinds. With a plain flour base or using the mix; korean watercress and thinly sliced chili peppers; or grated korean zucchini and chili peppers; or chives. The dipping sauce was sometimes just soy sauce, vinegar and chili powder, or sometimes she added chopped green onions, sliced chilis, chili pepper and sesame seeds and skipped the vinegar. 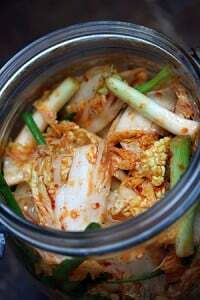 My all time favorite is using just julienned kimchi (soured) and pork. You don’t even need a sauce for that. thanks for this recipe! i’d love to know how the beer works in the batter. could you let me know? hey david, just wanted to thank you like a million times for this amazing recipe. 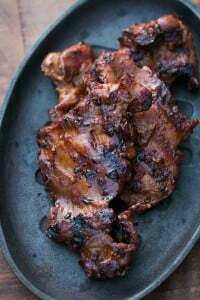 since you posted it i must have made this a gillion times as my fav quick go-to recipe. thanks a lot! Jeremy: They actually sell kimchi chocolate at Incheon Int’l Airport. Never tried it, and prob. won’t unless someone buys some for me. Becke: Yes, as some have pointed out earlier. The original scallion pancake is just a flour batter (no eggs) and scallions, for which we use a simple sauce (chili paste + vinegar to taste). With the “eggy” versions of these pancakes, which seem to have become the norm of late, the dipping sauces are usually based on soy sauce, with sesame seeds (or sometimes, sesame oil), powdered chili, garlic, etc. For the smaller bite-sized pancakes, soy sauce and vinegar works great. S: In addition to condiments, the pajeon mix contains some raising agent for fluffier and crispier pancakes. jh: ‘Bindaedduk’ is *not* another name for jeon (savory Korean pancakes). It refers instead to a specific variety of pancake made from pureed mung beans (puree soaked mung beans — that’s your batter), which is very fluffy and crispy (even w/o the help of raising agents). I like to top mine with slices of kimchi, scallion, pork (go for the belly if you can get some), mung bean sprouts, slices of chili and/or onions–the Korea version of a pizza. Interesting and good looking dried red peppers! I haven’t noticed those in Seoul stores yet. And I think it can make any light color dish look more delicious. are there any suggestions you have that can help me? i used a 9inch skillet and all the proper ingredients. thank you!! I love your recipes/articles on Simplyrecipes, and I’m glad to find this recipe. I noticed though that from the picture, you were using garlic chives (nira as they’re called in Japan) and not scallions or green onions. They look very similar but supposedly, they have more of a garlic taste and not so much of an onion one. 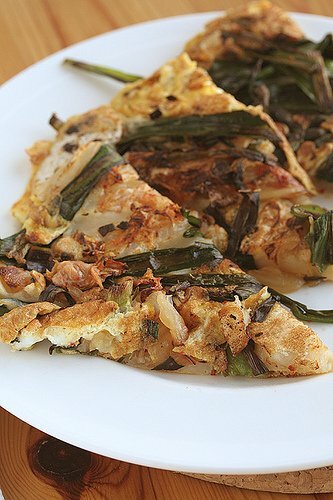 I’ve never cooked with them, but I was wondering if you’ve made the pajeon with actual scallions and if you’ve found that to be the case? Would you use them interchangeably? Also, have you tried using rice flour as opposed to regular flour for the batter? I would think that it would be lighter and less dense…a good thing, so you get more veggie flavor? Sarah: Scallions aren’t easily available (at least the kind that we get in the states) in France, so the ones I use are what I buy at the Korean market here. You could use regular scallions, or green onions, in this recipe. I’ve not used rice flour but there is a special pajeon flour (or mix) that is sold in Korean stores, which I haven’t tried either. Pajeon is one of my favorite food. We can never get enough of it when we travel to Korea. I cook this at home as main course or appetizer, using rice flour mix with regular flour. You can make varieties by adding different ingredients such squid, shrimp, kimchi, chilli pepper, garlic, scallion, onion, cheese and whatever as you wish to the main garlic chive and egg. 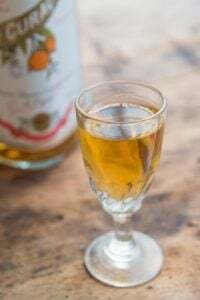 The dipping sauce – light soja, sasame oil, toasted sasame seed and little rice vinegar. You can also put the pan under the broiler, if you use a pan that can withstand the heat. This was totally awesome. Love your recipes, they are simple,honest and wholesome!